This is a two-week cross-curricular unit for Grades 1-2 on Saturn and its rings. It integrates reading, writing, art, and science to provide a multi-sensory exploration of the structure of Saturn and its place in our Solar System. Children will draw and write to express their knowledge, read picture books about the Solar System, create outdoor scale models of the distance between Earth and Saturn, design a 3D physical model of Saturn and its moons, and more. The resource is almost completely turn-key and includes detailed lesson plans, pedagogical support, assessments, printable lab notebooks, warm-up questions, and background information. 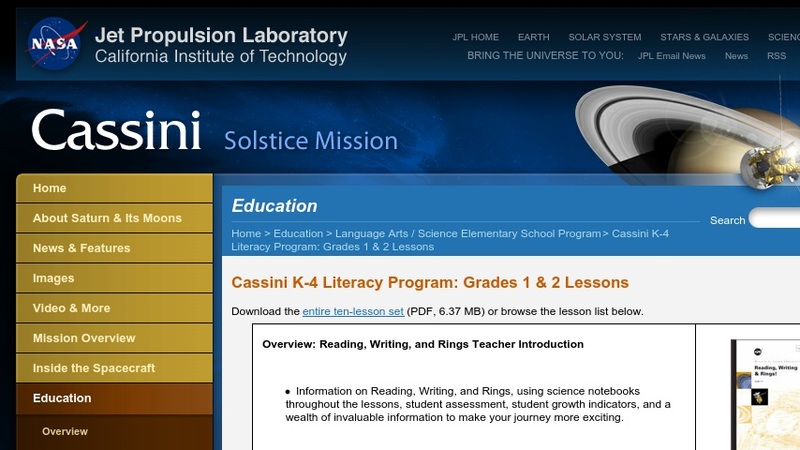 Each lesson draws on data from NASA's Cassini mission as its factual basis.